Welcome, Heather! Congratulations on the release of Sweet Madness. I finished reading Gabriel and Penelope’s book last night and it was wonderful! Please tell our readers what they can expect from this book. Thanks, PJ! I’m so thrilled to be back at the Romance Dish today. I’m even more thrilled that you enjoyed Penelope and Gabriel’s story. When I sat down to write it, I was convinced it would be the book that ruined my very short career. I’m pleased to discover that I seemed to have been wrong about that! As for what readers can expect from Sweet Madness, I would say a bit darker and more emotional story than my previous two. Both characters are tortured, and have to go through some dark places to come back to the light. 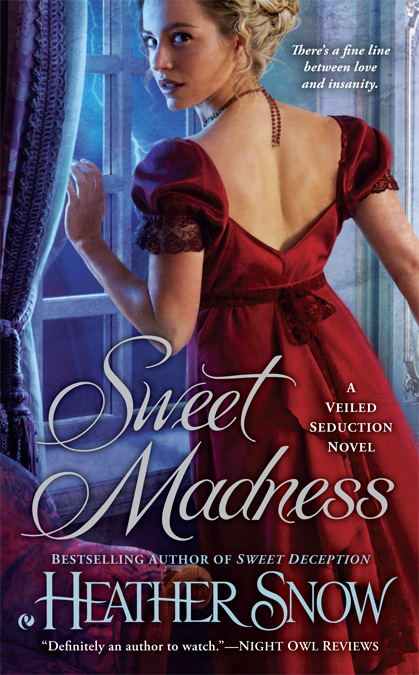 But Sweet Madness is a story of the healing power of love, and hope, and I’m hoping readers find the happily ever after even sweeter given what Penelope and Gabriel have to go through to get there. Gabriel and Penelope are both compelling characters. What one thing do you want readers to understand about each of them? heroine Penelope will make. After all, Liliana—the lady chemist from Sweet Enemy—and Emma—the lady criminologist and mathematician from Sweet Deception—were both brilliant women who reveled in pushing the boundaries of society. Readers might remember Penelope as a kind but average debutante who was content to live the privileged life she was born to, as we first see her in Sweet Enemy. And that may have remained true, if her husband’s tragic death hadn’t shook her to her core and driven her to study mental maladies. It was a fun challenge taking Penelope and helping her discover her inner brilliance. Penelope had to realize that she was never average at all, and that everything she needed was within her all along, if she only trusted herself. Gabriel, on the other hand, is a born leader, a man who fixes things, who is responsible and strong and who thrives on being useful. And yet his mysterious madness has rendered him useless, at least in his own mind. He, too, had to learn to trust himself again…one of the many things that made he and Penelope perfect for each other. I’m so glad I was able to get Gabriel across accurately. I hope I also was able to convey his strength and dignity in spite of his struggles. As for whether I researched or wrote from the gut, I’m going to say both. I did a lot of research on PTSD, on the causes, effects, symptoms and treatments, searching for ways Penelope could instinctively help Gabriel, even though they knew so little about it at the time. I read articles, medical journals and first-hand accounts. But when it came down to the writing, even with all of the research, I had to try to put myself there—both for Gabriel and Penelope—to be able to pull the emotions off. Some of those scenes were wrenching to write. Without giving away spoilers, what one scene would you never cut from this book? The art therapy scene. There wouldn’t have been any formal art therapy at the time, of course, but Penelope was an artist and she’d stumbled across the benefits of art accidentally and intuitively. “I know that I said I was willing to do anything you suggested, but how exactly is this supposed to help?” Gabriel asked, eyeing Penelope skeptically. It was mid-afternoon the following day and the two of them were alone in Somerton Park’s long gallery. The massive high-ceilinged room was dotted with comfortable-looking tufted benches, chaise lounges, a walnut pianoforte and the occasional overstuffed chair. A fire crackled in the massive hearth, centered along the interior wall. The other side of the room boasted tall windows separated by scarcely a yard between them, and every available patch of wall space was covered with colorful portraits and landscapes in gilt frames of varying shapes and sizes. But the only canvas that interested him at the moment was the blank one on the easel in front of him. Penelope grinned at him as she removed the lid from a cylindrical earthenware container about the size of a large pumpkin. Red paint oozed out of the tiny hole she’d made, and the crisp tang of linseed oil reached his nose. Pen squeezed a dollop onto a wooden palette and then plugged the hole with a tack before placing the bladder of paint back into her container. She smiled and added another color to the palette. “I have a theory that the mere act of creating puts us in a place of positive emotion. Sometimes we can gain insight simply by observing what we’ve created. And I believe that sometimes the artistic process can bring feelings to the forefront for us to see, even when it is not our intention. Once we can view those feelings objectively, we are free to abolish them as we see fit.” One last dollop, white this time, and she placed the lid back on her pot. He looked at her, gathering art supplies and speaking passionately about the ways she’d discovered to relieve others’ suffering—men like him. Didn’t she see that she was brilliant? But even more, she was compassionate and kind. All of the intelligence in the world would be fruitless without those higher qualities that Penelope had in abundance. Pen slipped a smock over her dress. “Everyone has a spark of creativity within them,” she protested. Gabriel’s breath caught in his throat. Pen had already turned her attention to readying her brushes and wasn’t looking at him at all. He knew she hadn’t meant her words to imply anything, but as he watched her graceful movements, he thought, You, Pen. You could inspire me to do whatever you wanted. He’d paint if she desired it. He’d burst into song. Hell, he’d build her a bloody temple with his bare hands if she wished it, chiseling every stone himself. With a spoon. This is just a small excerpt from the actual scene, of course. What made it so fun to write, aside from how I get to use painting and symbolism, is that is a turning point scene. It is near the middle of the book and Penelope and Gabriel have been working through some dark things and are making progress in their goal to discover what has been causing his struggles. But something happens during this session that makes Penelope turn a hard eye on herself and you start seeing the vulnerabilities and hurts that she is hiding…and how Gabriel is going to be able to help her just as much as she can him. We love our comfort reads around here. To what book or author do you turn when you’re in need of some fictional comfort? Anything by Lisa Kleypas. I’m just so in awe of her writing. It’s smooth, it draws me in subtly and completely and it never fails to dazzle me at some point or another. Lisa’s writing is also so lush and her characters so perfectly crafted, I can’t help but fall in love even if I practically know the story by heart by now. I’ll re-read Devil In Winter, Dreaming of You or Worth Any Price any time. How do you celebrate the release of a new book? Do you have any special traditions? My first book, I celebrated with a cake made like the cover and a lovely dinner out with friends. It was fabulous. Since then, I’ve been on deadline! So now release day is like another deadline, rushing to write blog posts and newsletters and Facebook posts, etc., all while trying to keep the Heir and Spare from tearing up my office an deleting everything on my computer. Not much time for celebrating! If you were interviewing yourself, what one question would you ask? And how would you answer? Hmm…how did you become a historical romance fan? I’ve been reading romance as long as I can remember. I’ve been hooked since I found my Nana’s secret stash, hidden on the lowest bookshelf, tucked behind her recliner. She was a historical romance fan, so that’s what I started with and it is my first love. I don’t remember the specific books anymore, though there were many by Kathleen Woodiwiss, Judith McNaught, Johanna Lindsay, Julie Garwood, Jude Devereaux and Janelle Taylor. Ice cream? Chocolate. In fact, the only way to eat vanilla ice cream is slathered in chocolate syrup. Cake, however? Vanilla or White. Preferably with some chocolate ice cream. Night Owl. Over the years, I’ve whipped myself with the whole “Early to bed, early to rise makes you healthy, wealthy and wise” stuff, but I just can’t seem to change. Plus, with the Heir and the Spare being 4 and 1, the only time I can get anything done is when everyone else is asleep, and I can’t sleep if I have a lot on my mind, so I can’t go to bed until it’s done! Movies. I like that I can spend a couple of hours and have a story resolved. I’m not good at waiting through a whole season to see how something turns out! Evening gown—but with flats. I’m not a heels kind of girl. Thanks, Heather! Would you like to ask our readers a question? Yes, I’d like to ask them the same question I asked myself: How did you become a historical romance fan? I’ll be happy to give away the winner’s choice of either of my first two novels, Sweet Enemy or Sweet Deception, open internationally. Congrats on the new release, Heather. I love Lisa Kleypas' books, too. Nick is one of my favorite heroes. I was introduced to historical romance by my older cousin's best friend. She lent us books by Julie Garwood and Jude Deveraux. Thanks, Jane! Those are all great authors to get hooked on! I've always loved History, so I suppose Historical Romance was just a natural progression of that. Yes, exactly! I can't tell you how many times I've learned something interesting in a romance novel and used that as a jumping point to look further and research something fascinating! I first discovered romances via Good Housekeeping magazine. Then I went on vacation and read LaVyrle Spencer. I came home and visited the local library. I became hooked on Catherine Coulture, Nicole Jordan, Mary Balogh, Madeline Hunter, Karen Robards, Elizabeth Lowell, Sandra Brown, Nora Roberts, Diana Palmer, Cathy Maxwell, Kat Martin, Laurie McBain and Joanna Lindsay. I fell in love with the richness of the historical romances. I loved learning about different time periods, countries, cultures, mores etc. I still reach for historicals first and contemporaries second. How fabulous that you picked up that magazine :) I love the library for finding new to me authors. When I discover one, I have to run out and buy the rest of their work! I used to read suspense and thriller. Then, one day, I just picked up a romance book at the bookstore and decided to give it a try! Well, I switch from thriller to romance, I am hooked to historical romance that the stories is about England and Scotland. I read all three books of Heather and found them breathtaking, specially Sweet Madness". Congrats Heather! Hi Nicole...I stepped away from romance in college, switching to suspense, thriller and horror (oh the horror!). Then I discovered Lisa Kleypas and I came running back to historical romance with open arms...lol. Thank you for your kind words. So glad you enjoyed my stories! I discovered it first when I was a teenager with Sweet Valley High... Then I was REALLY bored one day on a cruise and I found Rachel Gibson's book... And that's how I got hooked! Ah...see, the best things come from finding something to do when you're bored! Glad you found a romance book! 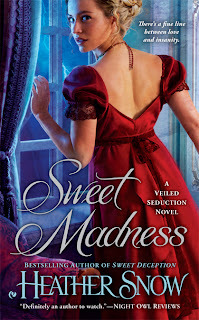 Congratulations on the release of Sweet Madness, Heather. I have a copy on my TBR and look forward to reading it soon. I have loved the earlier books in the series. My favorite "girl books" were those by Louisa May Alcott, Lucy Maud Montgomery, Maud Hart Lovelace, and Laura Ingalls Wilder. All were set in the 19th or early 20th century, and so when I moved to adult books, historical romance was a natural progression. Thanks, Andrea. How awesome that you remember your first romance novel! Sadly, I can't remember, though I'm pretty sure it was a Kathleen Woodiwiss...or maybe a Johanna Lindsey. Oh well, all I know is that it was great! Congratulations, Heather, on your release! Ooh, sounds delish! I have an indie bookstore I go to and, after being stuck reading Harlequins all the time, I told the owner that I needed something new. She asked me, "Have you ever read a book by Julia Quinn?" Well, the first one I read of hers was THE DUKE AND I and I fell in love with JQ's writing and historical/Regency romances. Bobbie, the owner of the store, knows what kind of stories I like, so she's always holding new ones for me to try. 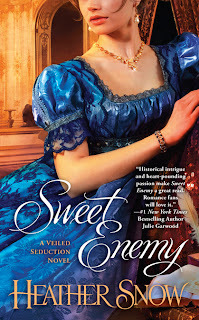 Oh wow...to be introduced to historical romance by Julia Quinn. Tough act to follow! How wonderful that you have such a great bookseller in your area. That's fabulous. I have to admit I haven't read you as yet but your books sound like something I would really enjoy. I started out reading all the gothics and then I read The Flame and the Flower and The Wolf and the Dove by Kathleen Woodiwiss and I was totally hooked. I'm pretty sure I'm not alone there and she got many a reader hooked on romance lol. Have to say I love your covers! I remember the Flame and the Flower and Shana best from Woodiwiss, devouring Julie Garwood and Jude Devereaux, then Johanna Lindsey, Judith McNaught and Janelle Taylor. Anyone remember that series she did in space? I can't remember the titles exactly right now...One had Stardust in it and one had Moonbeams... That's one of the great things about the internet is that I was able to find those later and buy them again! Congrats on the new book. I started out by reading Shanna by Kathleen Woodiwiss and than tried some other authors. I soon discovered Marsha Canham, Judith McNaught and Nora Roberts. Thanks, Kim! I've never read Marsha Canham. Should I try to find some? Even as a little girl, I loved reading and history. Historical romance combines those early loves! Hi Heather! Thanks so much for being our special guest today. It's great to have you here! I'll be back online later tonight to read and respond to comments. Hi Heather! I'm halfway through SWEET MADNESS and I'm trying to read slow to savor it. I'm loving Pen and Gabriel. I also started my love of Historical fiction by raiding my Grandmother's stash. LOL I used to tease her because she would skip over the intimate scenes. She once asked me, "How can they kiss like that? It's like they're eating each other." *gg* Being the good girl I was, I asked her if she'd ever tried it. LMBO! She just blushed and rolled her eyes. She was a hoot! I'm SO glad you're enjoying Pen and Gabriel :) I wish, now, that I would have talked books with Nana...we both read them, but never really discussed them much, though we talked about everything else. I dedicated my first book to her...she's the one person I really wish could have read it! A blur of amazingness...I love it! I love to follow people around on their blog tours, because you do get to learn so much over the course of lots of posts and interviews! Well the first romance book I ever read was Gone With the Wind and that got me hook of historical romance and have been reading it ever since. Don't smack me, but I don't think I ever read Gone With the Wind... Saw the movie, of course. I might just have to remedy that! I love historical romance. I first became interested with Julia Quinn and Lisa Kleypas. Now I am addicted to historical.